Single-syllable and adjectives ending with -y become comparative by adding -er to the end or changing the -y to -ier. Place the word more in front of other adjectives. Comparative adjective is used to compare two things. A superlative adjective is used when you compare three or more things. For example, looking at apples you can compare their size, determining which is big, which is bigger, and which is biggest. The comparative ending (suffix) for short, common adjectives is generally "-er"; the superlative suffix is generally "-est." For most longer adjectives, the comparative is made by adding the word "more" (for example, more comfortable) and the superlative is made by adding the word "most" (for example, most comfortable). This worksheet provides exercises for using comparative and superlative forms with all types of adjectives. 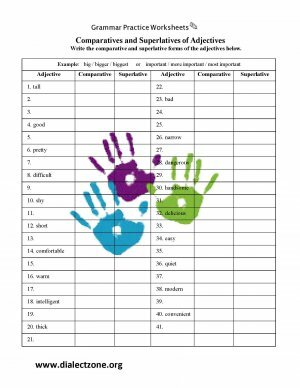 This document contains the worksheet and answer keys to Comparatives and Superlatives of Adjectives.